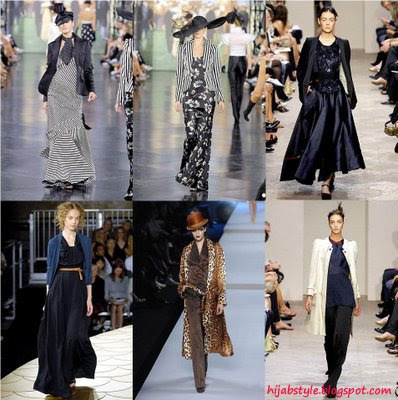 I realise I'm a little behind with posting the runway fashions, but here is the first of 3 installments on 'Designer Hijab Style', featuring outfits from Spring 2008 ready-to-wear collections. Fall 2008 will follow soon after that inshallah. I'm glad to see blazers over maxi dresses are a popular look, as seen at Ralph Lauren and Italian label 6267. Black and blue was a widely-featured colour combination, as per 3.1 Phillip Lim, whilst Dior went for the rather dubious animal-print coat. Which of these looks are your favourites? I liked the dresses in the first two pics, although they are quite form-fitting. I like animal-prints, but this coat is too too Bet Lynch, which is not a good look. I always wear long dresses with coats or sweater wraps for parties (sans hijab). Umm salihah the first two dresses are fab---Hayah, am I right in guessing they are Ralph Lauren? Maybe? Yes the first two are Ralph Lauren, third is 6267. I thought the rest of Dior's Spring '08 collection was gorgeous! Reminded me a lot of Tesettur-style outfits. Will post soon inshallah. Are you for real, I love your blog! Thanks for the effort, I am sure I will be checking again soon. I love the striped blazer with the black and white printed dress. Its so chique. the second outfit is my fav!